ARE Park Town in Panvel, Mumbai Navi by ARE World is a residential project. The size of the Apartment ranges in between 520.0 sq.ft. and 685.0 sq.ft. ARE Park Town offers facilities such as Gymnasium and Lift. It also offers services like Community hall and Grocery shop. It is a ready to move project with possession offered in Apr, 2016. The project is spread over a total area of 20 acres of land. ARE Park Town has a total of 22 towers. The construction is of 4 floors. ARE Park Town brochure is also available for easy reference. What is the project location?The project is located at Panvel, Mumbai Navi. What is the area of apartments in ARE Park Town? The area of apartments offered in the project ranges from 520.0 sqft to 685.0 sqft. What is total area of 1 bhk in ARE Park Town? 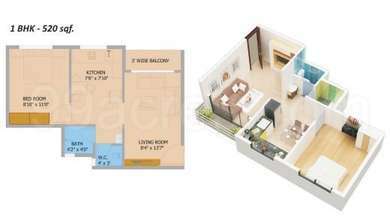 1 BHK unit in the project are available in an area of 520.0 sqft to 547.0 sqft. What is size of 2 bhk in ARE Park Town? The area of 2 BHK apartments ranges from 660.0 sqft to 685.0 sqft. What is the area of ARE Park Town?The total area that the project occupies is 20.0 Acres. Does ARE Park Town have kids play area? Yes the project has kids play area.